Casa Catrina (formerly Casa Cumpleanos) has finished an extensive remodel resulting in five master bedrooms all with private baths. A separate detached 1BR/1BA guesthouse is also available. Kitchen: Fully stocked with everything you will ever need to create incredible meals. Or, have our staff prepare them for you for an extra fee. Giant cooler filled with ice upon your arrival. Staff: Full time maid and gardener available for errands, meals (extra fee), and more. Of course beach chairs, umbrellas, towels, and everything else you need are included in this luxury rental. This is the 9th vacation rental we have created in Sayulita and is truly our masterpiece. We look forward to answering any questions and hopefully welcoming you to this wonderful home! We stayed here as a group for my bachelorette and it was just gorgeous. We had plenty of space, the beds were super comfy, the showers had great water pressure and the views were outstanding. I would come back here any day. Beautiful home, indoor / outdoor living! We spent four days in this beautiful home to celebrate my brother's engagement. The house is lovely, with large bedrooms each with an ensuite bathroom. The kitchen falls onto and outdoor living room and dining room, and a lovely pool. The house is a 3 minute walk to a semi-private beach. So relaxing! The housekeeper prepared us a traditional Mexican dinner one evening, it was such a treat. Overall, we were all very happy and would definitely stay here again! Best place we have ever stayed in Sayulita. We were overjoyed to realize the pictures did not represent the house. Pictures could not represent this property. Absolutely stunning. Private, beautiful, stunning, completely awesome. Staff was incredible. This house was so much more than we were expecting! Very clean, spacious, indoor/outdoor living at it's finest! I can't pick a "best" part as it was all amazing. Having a bathroom in each bedroom was spot on - every couple had a "master" suite! The pool is large and the view (& sound) of the ocean was amazing - we could see whales from the dining patio! The grounds are beautiful, like being in the tropics with the ocean at your fingertips. The staff came everyday which was so nice - the house was always "fresh" for us. The owner and manager were available if needed (responded promptly!) and had great info about Sayulita for us during our stay. Would definitely return (didn't want to leave)!! The best house in Sayulita! We rented casa catrina for a week and absolutely fell in love with the house! Kerri the owner was so helpful answering all of my multiple questions about the place and sayulita since it was our first time. The views, the pool, the landscaping at the house was absolutely amazing. It was definitely paradise! The town of sayulita is a wonderful small town but we had everything we needed at the house. The pool was perfect for swimming and laying out each day. We loved having a daily cleaning service come each day and clean things up in each room. There is nothing better on vacation then not having to clean up after yourself. The location was perfect it was on the north side of town so it was very quiet and relaxing but yet so close to the Beach and the ocean. We were even able to spot whales in the ocean from the dinning area, talk about an amazing experience! I think we came at the perfect time of year for whale spotting. The house was set up so each bedroom had their own bathroom which is one of the best things about sharing a house with multiple couples. We had a great time and will definitely be back at casa catrina in the future! 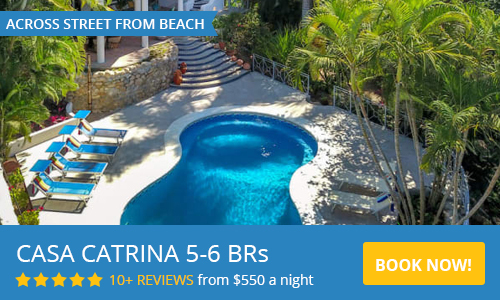 Unbelievable property in the best area of Sayulita. Super quiet and tranquil all of the time. I think we were the second group to stay there so everything was brand new. Great towels, sheets, kitchenware, etc. The home is right across from the north end beach which is way less crowded. Pool area is super rad with towns of room and chairs. We did not use the guest house but it looked very cute as well. Would highly recommend this property to any large family or group. Five stars all the way! This place is an absolute GEM. For the past 18 years I have called Sayulita my home. Here I enjoy life with my husband and my two young boys. We love Sayulita and love to share all of our local knowledge with our guests helping them create the best vacation ever.